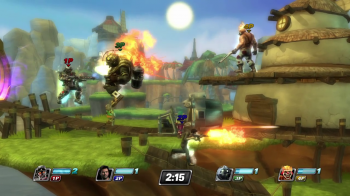 PlayStation All-Stars Battle Royale will have 20 characters at launch. No Spyro. No Crash. PlayStation Blog senior social media specialist, Sid Shuman, has revealed that the PlayStation All-Stars Battle Royale launch roster will be limited to the 20 characters announced to date. That means no Snake, no Kat from Gravity Rush, no [insert your favorite character here], at least not when the game hits the shelves on November 20th. This doesn't mean the cast is capped at 20; It seems unlikely that Sony would pass up the opportunity to make some bank on roster DLC. Unfortunately, Crash Bandicoot, doesn't seem to have made the cut. Developer SuperBot Entertainment has already ruled out adding the former PlayStation mascot as DLC, which means he most likely won't make it into the game. The characters that have made the cut are listed below along with the games they feature in. Before you all start reaching for your red correction pens, if a character has had notably different incarnations, I've listed their most relevant appearance. For comparison, the original Super Smash Bros. had just 12 playable characters. Brawl, the most recent installment in the series, clocks in at 35. While I can forgive the absence of PS1 mainstays like Lara Croft, Raziel, Spyro, Cloud Strife, Klonoa, Abe, Aya Brea, Chris Redfield, etc - as Sony doesn't actually own any of those franchises - the lack of several characters from the company's first-party catalog is perplexing.